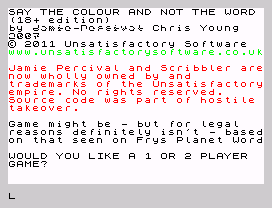 I have to cheat and post Chris’ own words (so I have to write less of a review): “Jamie Percival’s seminal 2007 hit “Say The Colour And Not The Word” has been *ahem* acquired legitimately *ahem* by Unsatisfactory Software, aka myself. The game was not disassembled, decompiled nor stolen (yes we’ve heard the rumours), we paid good money and we now own Jamie Percival, as soon as we find him. Erm, anyway, the surprise hit of 2007 (described by myself and partner-in-crime – NOT THAT THERE HAS BEEN ANY CRIMINAL ACTIVITY YOU UNDERSTAND – Mr Lake as “not as bad as Quest for The Golden Egg”) has been purchased legitimately and upgraded to an all new adults-only post-watershed Stephen Fry and Brian Blessed endorsed (probably) version“. So here you go. We are always eager to get new, refurbished, adult versions of hit games. I’m quite good at this, my top score was 843. Can you beat that? Just say colour, and not the word! Remember to press A if you get it wrong. And don’t cheat to beat my score!